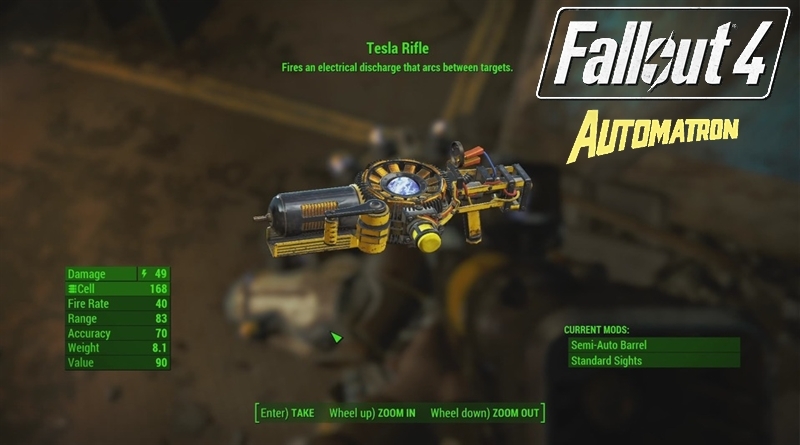 The new DLC Fallout 4 Automatron in not as big as we have expected it would be, but Commenwealth in Fallout 4 has certainly become more dangerous. Fallout 4 Automatron New Armor Locations guide will help you find new powerful armor pieces that are added in this DLC expansion pack. It is a unique variation of T-60 Power Armor that features open electrode current on both arm and chest pieces. You can acquire this by killing Ivey near the Hegan Satellite Arry area that is accessed during “Headhunting” quest of DLC story. She also has the Tesla Rifle which is really a heavy duty energy weapon that you can modify to make it even more deadly and I know tha you really want it so pick that up too! EyeBot Helmet is themed after Enclave’s eyebots, this helmet has no great feature except one, you can upgrade this helmet to surpass damage protection of Combat Helmet. You can found this on enemy Rust Devil raiders after the level 15. The robot helmet is really one of the most special and unique items added to this game with Fallout 4 Automatron DLC. The best thing about this helmet is that it responds to character’s stance, with visor appearing close when you have your weapons ready, to signify that your character is ready for combat. You can loot this helmet from Rust Devils in Robot Armor after you reach level 15. This helmet has highest base damage protection as compared to the above two helmets in this DLC’s armor. This Sentry Bot Helmet completely covers your dwellers face. You can found this helmet after reaching level 15 at the Rust Devil raiders. All these three helmets are random drops and you if you d not find at the specified location just visit later as they will re-spawn later. The crème de la crème of DLC’s new armor sets, Mechanist Set can be found at the Mechanist’s body at the end of DLC’s Story. You can also acquire this by completing peaceful version of the quest. Robot Armor Set is a full armor that can be found off of Rust Devil raiders and you may to do a little grinding to find all pieces. This armor consists of chest, leg, and arm pieces. Robot Armor Set is a tier above the normal metal armor of base game. Robot Armor Set can also be worn over different clothing items such as Military fatigues and Vault Suit. One thing to note that Rust Devil enemies only spawn after you reach level 15. The above videos are brought to you by the FudgeMuppet – Elder Scrolls & Fallout, I hope you enjoy!